As the forces of good square off against the forces of evil, only an unassuming clockwork repairman and an octogenarian former superspy can save the world from total destruction. Harkaway plays the English language like a mad virtuoso: he hits all the right notes but isn’t above throwing in a bit of ornamentation and jazzing things up ... 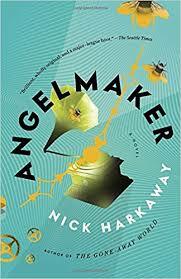 If you appreciate a well-constructed sentence and have a thing for fast-talking British muckety-mucks, then you should read Angelmaker for the writing alone ...like a Quentin Tarantino movie written by Neil Gaiman: larger-than-life characters, dry British humor, a heavy dose of the weird, and a bit macabre; horrendous things wrapped up in gorgeous language ...a great, action-packed book that doesn’t treat the reader like an idiot. Harkaway alludes to things and then goes off in some other direction, eventually circling back around to connect the dots. ...it [Angelmaker] fills our mundane globe with such a raft of hidden marvels and oddities that it transforms the known, miracle-devoid terrain into a marvelous and dangerous wonderland ... At the center of a large, entertaining cast of nonpareils and eccentrics, freaks and monsters, geniuses and idiots is one quite average, unassuming fellow... characters occupy a lively period from WWII to the present and frequent such outré venues... Harkaway has managed to recapture the lighthearted brio of an earlier age of precision entertainment, when the world was deemed to be perpetually teetering on the brink of Armageddon but always capable of being snatched back to safety with a quip, a wink, a judo chop, and the lurid highlights reflecting off Mrs. Peel’s leather catsuit. What did you think of Angelmaker?